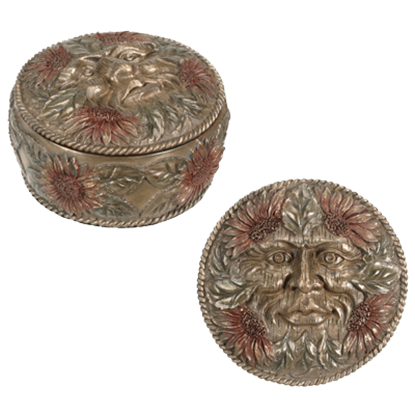 Let the watchful eyes of a greenman guard your jewelry, coins, and other small keepsakes when you place them within one of our greenman trinket boxes. 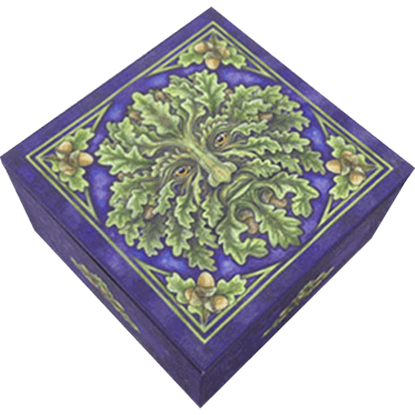 We offer a range of greenman boxes all depicting greenmen or greenwomen in beautiful, mysterious, and useful ways. Here you will find gorgeous, cast bronze greenman trinket boxes decorated with greenman faces in line with each of the four seasons. 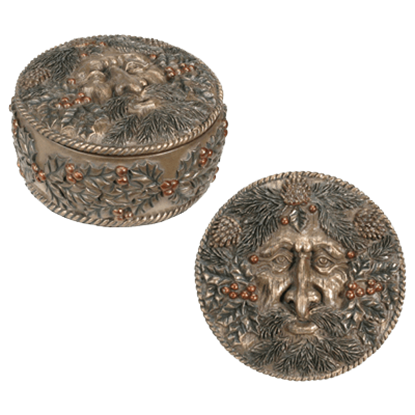 We also carry a greenman jewelry box with a face that resembles a forest king with his mighty beard made of leaves. 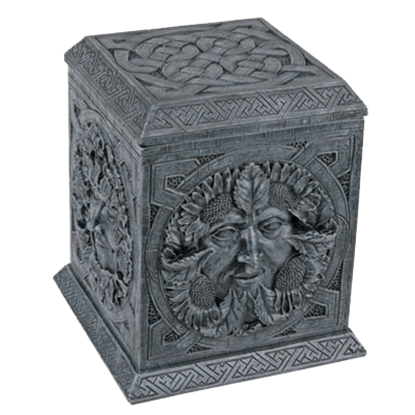 Our Celtic greenman boxes are perfect for adding a little historical flair to any room. Some of our greenman trinket boxes and greenman mirror boxes feature the work of artists like Lisa Parker and Anne Stokes that take the magnificence of the mighty greenman to the next level. 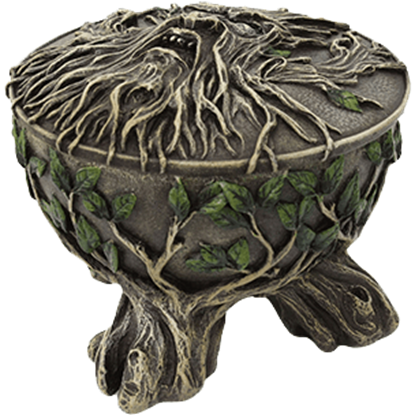 Whether you are a lover of nature, favor the feel of an enchanted forest, or are interested in the enigmatic roots of greenmen in general, our greenman trinket box category is sure to attract your interest. A symbol of rebirth and the season of spring, the Green Man appears in many cultures throughout the world. 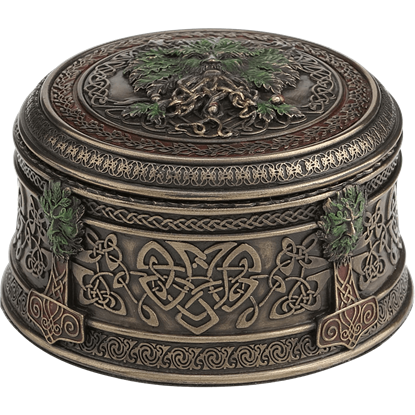 The Celtic Greenman Trinket Box depicts the face of this nature deity among Celtic scrollwork. 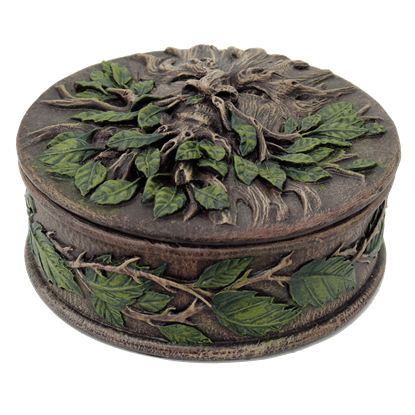 This trinket box features a green man ready for fall with his acorns and fall colored leaves. This box is made of cold cast resin and measures 1.5 inches by 3.25 inches. This box would make a great gift for any special someone. 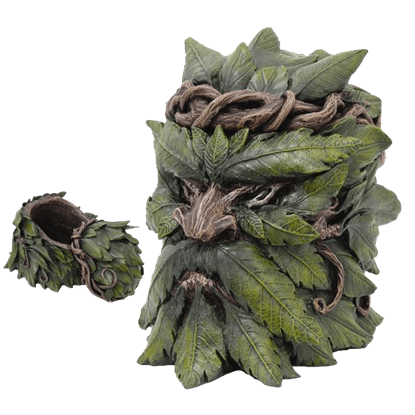 With its stern gaze and a disapproving frown, the Greenman Box is the ideal place to keep all of your trinkets and items, as this is one sentry that is more than happy to hold your things and keep them safe from onlookers. This green men box features a green man for every season! Spring is covered in dainty flowers, Summer is surrounded by sunflowers, Fall is adorned in leaves and acorns, and Winter is enveloped in holly bushes and pine trees. Mighty and mysterious, the greenman gazes with a stern, leafy face, his beard of roots forming intricate knots interspersed with small acorns. 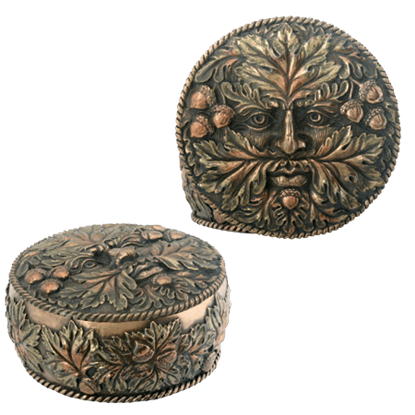 The Oak Tree Greenman Trinket Box depicts this greenman visage in beautiful bronze detail. The Greenman appears in mythologies from around the world as a representative of springtime and rebirth. 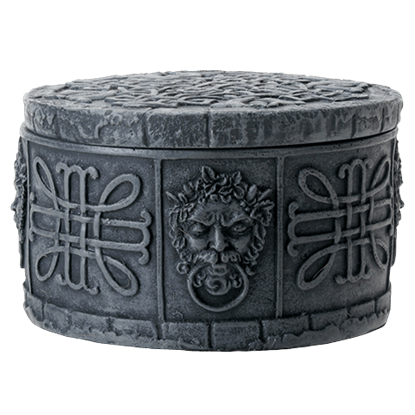 The Round Greenman Box features the face of this nature deity across its lid, shaped out of plant roots. The Green Man is an old symbol, seeped in religious and cultural symbolism from across the globe. And now, he is a popular symbol that can be found in many places, the least of which is this attractive Round Greenman Trinket Box. Staring at you with peace and wisdom in his eyes, the Greenman on the front of the Spirit of the Forest Trinket Box serves as a guardian of nature, especially the oak tree that provides the oak leaves and acorns in his face. 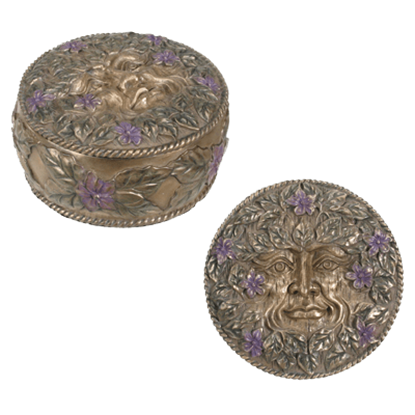 This trinket box features a green man adorned with purple flowers to symbolize the coming of Spring. This box is made of cold cast resin and measures 1.5 inches by 3.25inches. This trinket box is a wonderful gift for any loved one. This trinket box features a green man surrounded by sunflowers to represent the summer months. This box is made of cold cast resin and measures 1.5 inches by 3.25 inches. This trinket box would make a lovely addition to any home. This trinket box features a green man prepared for the winter months. He is surrounded by pine needles, acorns, holly leaves, and holly berries. He measures 1.5 inches by 3.25 inches and is made of cold cast resin.